SEPTEMBER is the month of the Independence ! . . .
FALL Specials until December 15th! Book a secured accommodation that you will find along the beautiful coast of the Mexican Caribe, anywhere from the reknown destination of CANCUN to all the way down the Riviera Maya. Reserve a 7 nights stay and save as much as 1-2 nights on the cost. If you have not travelled in the area for sometime, while you are here don’t forget to take the time to visit some new sites, out of the way places, new architectural ruins, as well as an infinite variety of marine life. Visit our web site and navigate through our pages at Vacation Rentals. If you are only passing through and looking for a place to stay on long term basis, start thinking about the 2014 season! Don’t wait too long to book a cozy vacation home such as CASA ALEGRIA. Make a Reservation. In Puerto Morelos, there is a wide variety of international cuisine and regional Mexican specialties. You will find them advertised on the Tourist Guide Map as well as on our Restaurants page. Long, lingering, lazy meals will be one of the highlights of your visit where you will find a range from cheap local places to world-class cuisine. Puerto Morelos is a native fishing village so when the menu states “Catch of the Day,” it really is! The restaurant owners, who take much pride in their establishments, are usually behind the stove or in some way overseeing your meal for that personal touch making your dining a genuine treat. No need to dress-up – strictly casual. 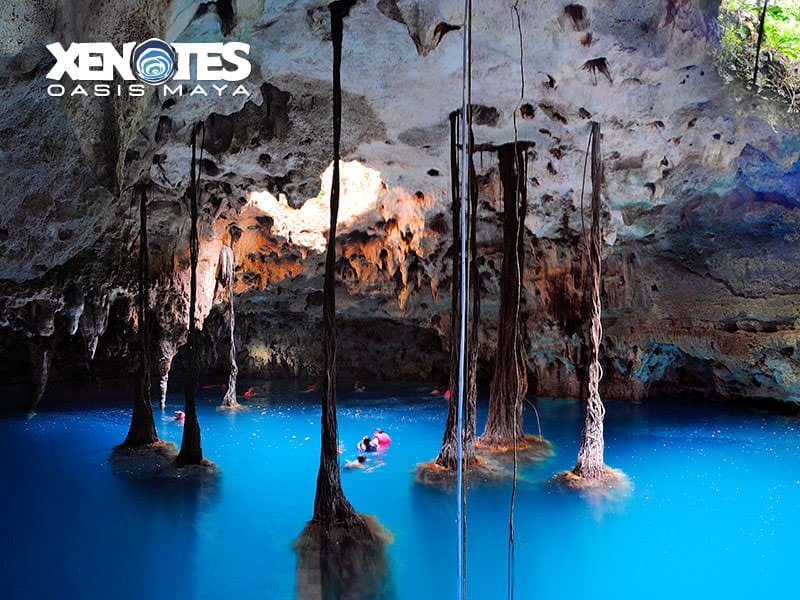 Do not miss to visit one of the several CENOTES that are open to the public and are located in the jungle across the Botanical Garden, along the “Ruta de los Cenotes” on the road towards Central Vallarta and Leona Vicario, in Puerto Morelos. Prices vary depending in services taken. Xenotes (Only with reservation though Experencias Xcaret) This company have a private tour, visiting 4 diferente Cenotes dedicated to the 4 elements. The Cenotes, are one of the most unique natural wonders of the Riviera Maya, these are created by an underground river system with more than 300 km around the Yucatan Peninsula, and are fresh water sink holes considered to be sacred by Ethnic Cultures such as the maya civilization. Take advantage of the $ exchange rate while in Mexico and your dollar value. You will be amazed at the savings you will get when you wisely travel in the area. For more information Contact Us. During your next trip to Puerto Morelos, make a point to visit the botanical garden that is the largest in Mexico. Located just south of the village, off Highway 307, with its 65 hectares is Dr. Alfredo Barrera Marin Botanical Gardens where you can admire this beautiful wildlife sanctuary and gardens. Going north towards Cancun, there is a Zoo, which is at the same time a crocodile farm where you can also interact with the ancient and fascinating reptiles. NEW! Visit the Cancun Underwater Museum, MUSA Visitors Center, located on the second floor of the Plaza Kukulcan and open daily to the general public. Vote for your favorite 8th wonder below. Remember, one vote per day, so come back every day to vote again. Voting is open June 3 — September 30. Visit Cancun Underwater Museum. To find out about Bike Rentals, go to the Facebook page Puerto Morelos Green Bikes. Learn it, live it and like it! . . . Visit Puerto Morelos Spanish Center to learn about the Language Center that has been operating successfully for over two years and continues to have remarkable success. Besides teaching Spanish, the Language Center also offers English and French language lessons on request. The Language Center has taught students from 6 to 80 with a staff of highly qualified professionals who have more then 40 years of combined foreign language teaching experience. Students are interviewed before class begins to determine your individual language level and goals, as the lessons are individually geared. With faculty guidance, students are able to reach and exceed individual learning goals and expectations through this student-oriented approach. Se que es un boicot, pero lo que hicieron es ilegal y atenta contra el medio ambiente grueso! Por favor compartan! “I LOVE PUERTO MORELOS” and for this reason I DO NOT FILL UP at the gas station next to the Manglare in order to care for them, as well as the reefs and the beaches. Thanks for sharing! The ROTARY CLUB of Puerto Morelos meets every Thursday evening at 8:00 p.m. The sessions are held in Spanish. Ask us the new location. Thanks. SEE YOU SOON IN PUERTO MORELOS !